On a surface level, a tribute album is all about the band being paid the tribute. Even if they themselves may never appear on the album, their compositions will be examined and executed from a different angle than what fans will have been familiar with. Keeping in mind that Yes are one of my all-time favourite bands (I myself have paid tribute to them with a cover or two), it’s an exciting prospect to hear some fellow fans of the almighty Yes paying homage in their own way, even if I have heard of very few of the artists. Leading me to my next point; although I have been brought here for Yes, “Tales From The Edge” has also served as a comfortable way to be introduced to the passion of many lesser-known prog acts. Whether it’s for Yes or a promising window-shop for talented prog artists, this is worth checking out. Although I’m sure quite a few people reading this will have a greater knowledge of prog than I, I found myself very surprised by how few of the bands I recognized performing here. I was already familiar with The Samurai of Prog, 3RD Degree, and the Hungarian act Yesterdays, and I may have heard Italy’s Conqueror name-dropped, but I was otherwise unaware of these bands. Though- for (hopefully) obvious reasons- the tribute does not demonstrate their own skill of composition, there are several artists here who impressed me to the point of wanting to check out their own work. Periplo offers a violin-rich rendition of “To Be Over” that develops upon the original. I had never heard of Italy’s Vanilla Project before, but to hear their brilliant classical arrangement of “Heart of the Sunrise” is something to behold. With the occasional heavy metal kick, and vocals that betray their progressive heritage, Vanilla Project’s contribution is among the very best here. While much of this tribute relies on intense, bombastic performance, Marco Mason’s “Show Me” is subtle, acoustic and works wonderfully. The Samurai of Prog deliver “Starship Trooper” in a way that recreates the energy of the original, although they don’t go much beyond the call with it. Brazilian cover band Yessongs do much the same with “Siberian Khatru”, and it’s often uncanny how close to the true Yes they’re able to sound. Tenmidnight do a version of “Tempus Fugit” from Yes’ Trevor Horn “Drama” era, and while they par the original with skill and arrangement, it lacks the intense energy that made the original so cool. Greenwall’s cover of the simple love song “Onward” even goes as far as to sound like smooth R&B, which- depending on where you stand with it- is either a good or bad thing. Truly, these and the rest of the performances on “Tales from the Edge” are all worthy of a listen, although some artists here take more of a welcome risk than others. 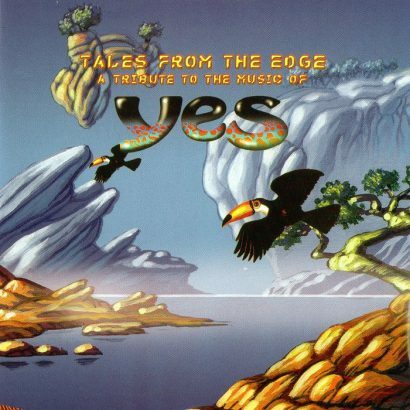 I’m not often a fan of bands doing covers to begin with, but a tribute album is a great way to hear a band’s music transformed by different musicians, and there are few bands with as strong a career as Yes’. In truth, there are only a handful of tracks that really had me look at the songs in a new light, but to hear such a great amount of talent in one project is worth the admission alone.